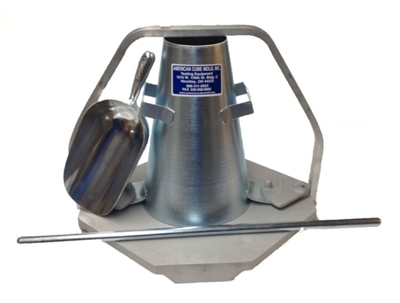 • ACM-36- Aluminum Slump Base with swivel clamps to secure foot tabs and a carrying handle that rotates up to use as a measuring reference. • ACM-32 – Spun Steel Slump Cone. Shipping Info: 17” x 17” x 17” – 25 lbs. 25” x 3” x 3” – 3 lbs.